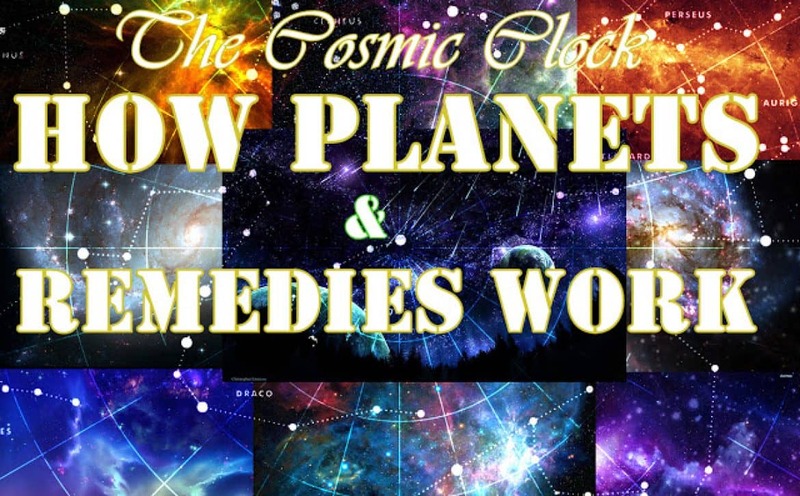 Home Vedic Science Archive by Category "Religious Rituals"
Astro-Ayurveda and Herbal Plants Research Series : The Ayurvedic/Herbal Plant (Bilwa) Remedy those are born in Visakha Nakashtra or Ascendant. Bael or Aegle marmelos is a spiritual, religious and medicinal plant, native of India and Bangladesh and spread throughout South East Asia. 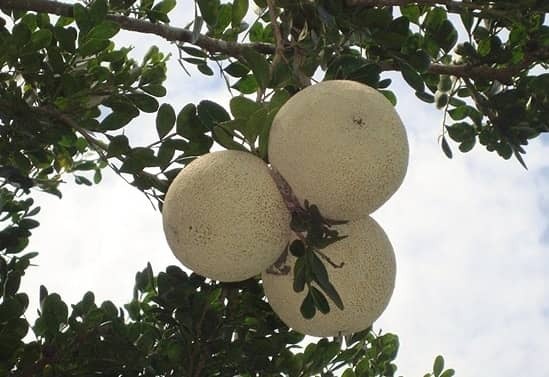 The fruit takes about 10 to 11 months to ripen. 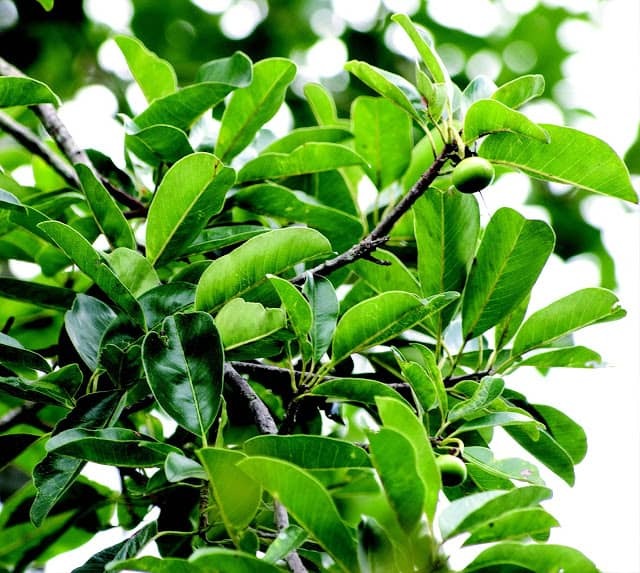 Wood Apple is a sweet, aromatic and astringent in nature. Bel has many benefits and uses such as to cure tuberculosis, hepatitis, dysentery, constipation, peptic ulcer, piles and many more, useful in worm infestation and stomach related problems. 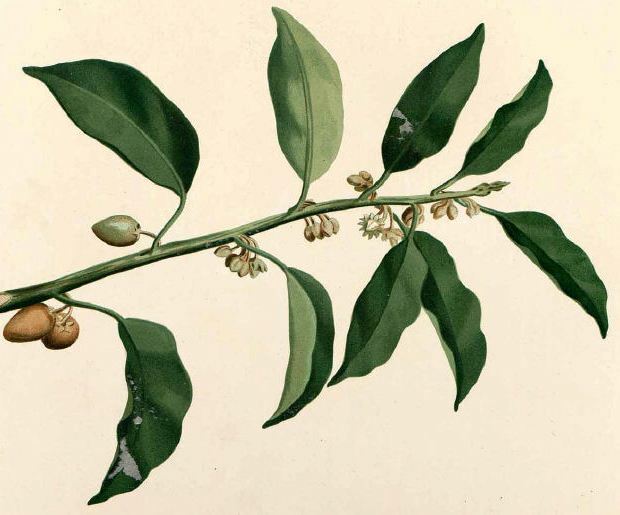 Bael or Aegle marmelos is also known as Bengal quince, golden apple, Japanese bitter orange, stone apple, etc. It is also known by various names such as Wood apple, Kaitha, Maredu Pandu, Vilam Palam, Belada Hannu, Koovalam, Kothu, Koth Bel, etc. It’s one of the few Ayurvedic plants whose entire parts from root to leaves are used for different diseases. The fruit balances Kaph and Vata doshas, its roots improve digestion, leaves are good for pain, stem for heart and bel flowers for curing of diarrhoea. 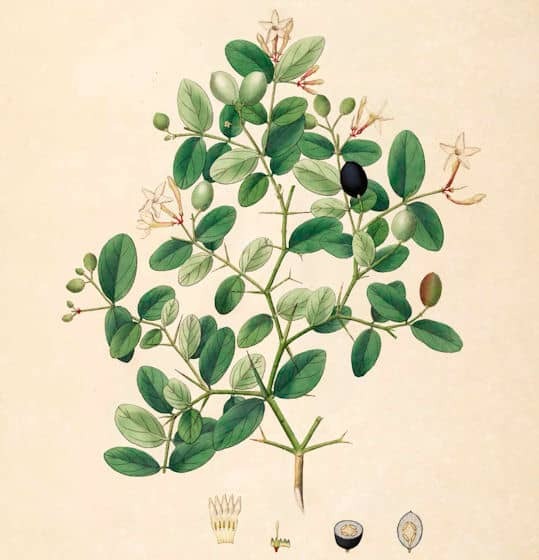 According to the Ayurvedic Research by V. NIGAM and V. S. NAMBIAR, Aegle marmelos or Bael is one such plant described in the ancient medical treatise in Sanskrit, Charak Samhita. It is popular medicinal plant in Ayurvedic and Siddha systems of medicine and folk medicines used to treat a wide variety of ailments. 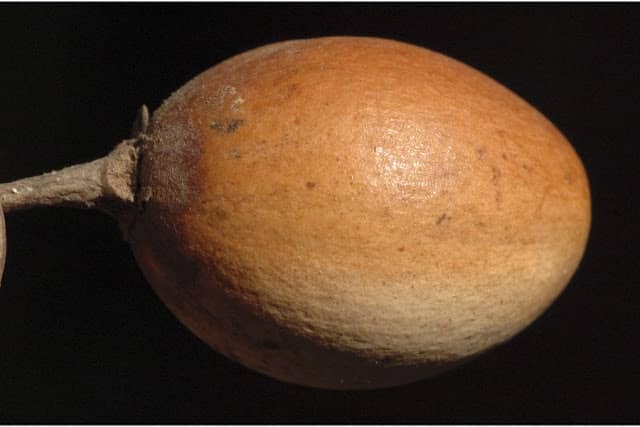 Aegle Marmelos commonly known as bael belongs to family Rutaceae. 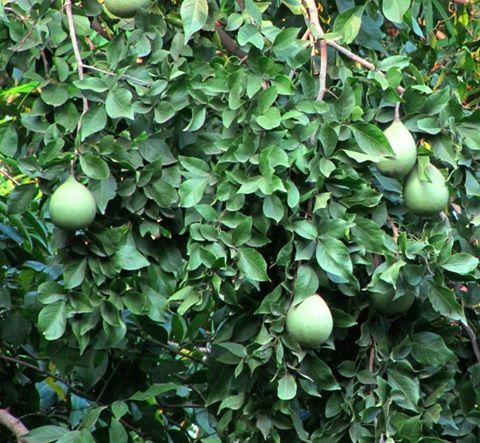 In Ayurveda Bael is termed tridosh har- remedy for three disturbances- bile, wind and phlegm. Aegle marmelos (Bilva) is considered as an embodiment of Lord Shiva himself and it is one of the sacred trees in Hinduism having spiritual powers. The translation of this stotra is given below. Leaves are offered in prayers to Shiva and Parvathi since ancient time. Bael having useful medicinal properties especially as a cooling agent, is a deciduous sacred tree, associated with Gods. This tree is popular in Shiva and Vishnu temples also popularly known as the temple garden plant and it can be grown in every house. Its leaves are trifoliate symbolizing the Thrimurthies- Brahma, Vishnu, Shiva with spear-shaped leaflets resembling trisoolam the weapon of Lord Shiva. The tree is also sacred to the Jains. 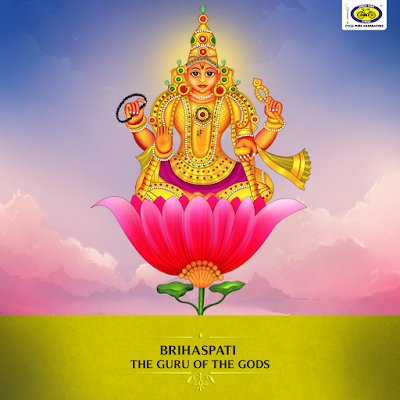 The 23rd Tirthankara, Bhagwan Parasnathji attained enlightenment under a Bael tree. The leaflets are given to devotees as prasadam in Shiva temples and as Tulsi in Vishnu temples. Bael has great religious significance. 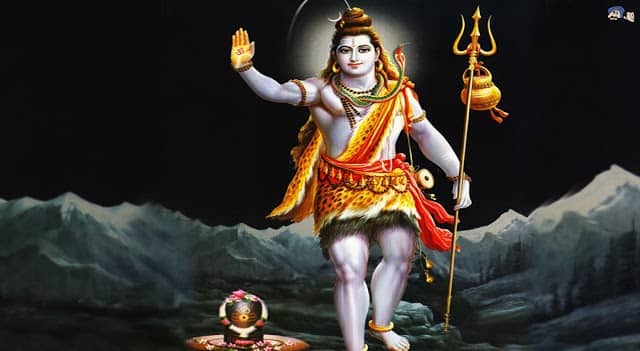 In Hindu tradition, the leaves and the fruit of the plant are offered to god during prayer, especially god Shiva. Its leaves are also used to worship Parvati and Viva Rupra. The fruit is used in religious ceremonies and rituals and its mentioned is also seen in Vedas and Mahabharata. 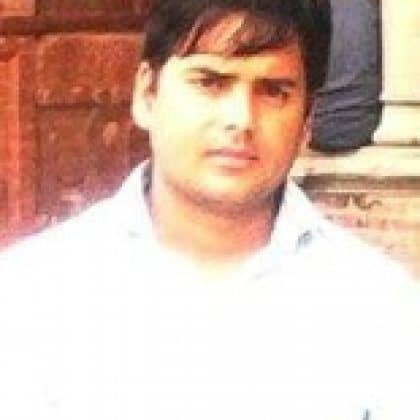 In a Research paper by Neha Parmar, Suman Singh and Bhupesh Patel on ” Historical and Ethno-Medical Review on Bilva Patra ” ; References regarding Bilva are abundantly given from the Yajurveda, Atharvaveda, Brahmanas, Kalpasutras and Puranas which suggests its popularity. 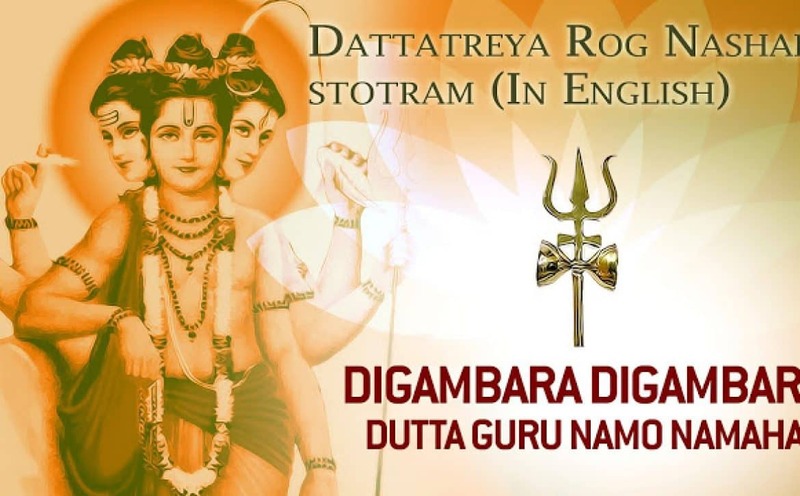 It is also mentioned in the Valmiki Ramayana and the Mahabharata. 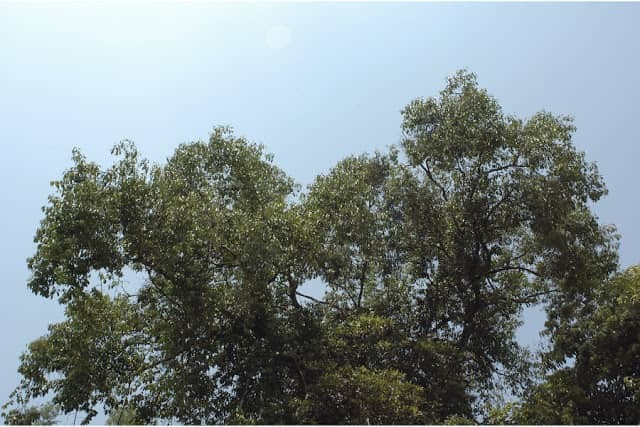 Historically it is referred to as one of the pious trees in the Baudhayana Dhamasutra, Taitiriya Brahamana termed the Bilva tree as a propitious tree. In ancient India, Bilva was considered as the most sacred of all fruits, and was used as the main food offering to the temple deities. In recent times coconut has superseded the Bilva as the principal fruit of religious offering as a symbol of self-surrender. Hindu iconography is replete with Bilva, too—its trifoliate leaves emerge on Shiva’s crown and trident, and the points of three-pronged leaves also represent the holy trinity of Brahma, Vishnu and Shiva. Its amulets were made and worn for removing the evil effects. 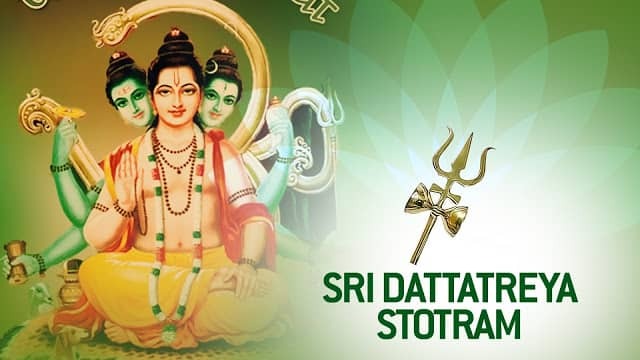 It was regarded as the symbol of fatness and fertility as it increases in size from the roots up to the branches and yield’s fruits every year.Among the eight leaves of Bilva offered to Lord Shiva, it is believed to be Mokshasadhanam in Lingarchanchandrika. 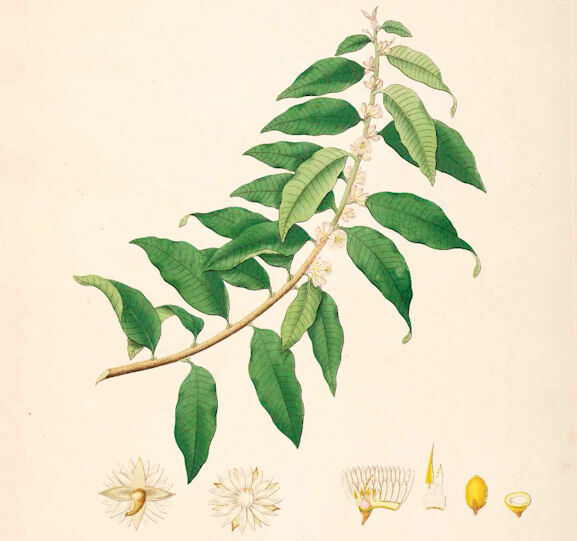 According to Maitra, Bilva tree is said to possess essence of celestial light. 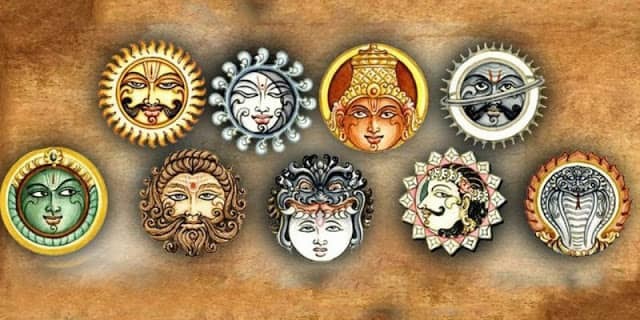 It is told to wear ‘Bilva Mani’ as an ornament for Dusvapnanashana (removing bad dreams), Rakshoghna (destroying evil), Rasayana (elixir of life), Prajasthapana (preserving progeny) and Vishaghna (antivenom) in Shankhyana Aranyaka. Water made out of Bilva Patra is used for bath in bridal rituals. It is told to wear Bilva-danda in Upanayana Samskara too.Bilva was also used as a stick by the Babylonian slam 7000 years ago. (Alimas, et al., 1996). The tree is also sacred to the Jains, as the 23rd Tirthankara, Bhagwan Parasnathji is said to attained enlightenment under a Bilva tree. In Agnipurana, inhaling the oil obtained from this plant is said to increase the poetic acumen of the inhaler and enables him to live a long life. Further, either the decoction of Bilva fruits, Mangifera indica, Dolicos lablab, Woodfordia fruiticosa, Zingiber ofcinale along with buttermilk and molasses is mentioned in treatment of gastroenteritis or the decoction of Bilva, Aconitum heterophyllum and Holerrhena antidysenterica should be given. Bilva is also said to cure fever associated with pain and cough. A hunter once had to go hunting on the day ofMaha Shivaratriwhen Lord Shiva is worshipped because his family was hungry. At the end of the day, the hunter was not able to find any prey. He climbed a tree by a lake, waiting for an unsuspecting animal to come for a drink. He did not realize that the tree he had climbed was a bilva tree. Buried at the foot of the tree was a Shivling, the representation of Lord Shiva for worship. During the night, he kept throwing the bilva leaves on the ground and they fell on the Shivling. 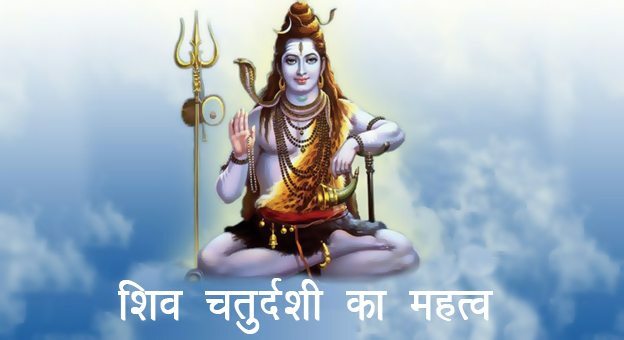 This unknowing worship to Lord Shiva was enough to transform the hunter into a compassionate and understanding human being and frees him from his past bad karma. 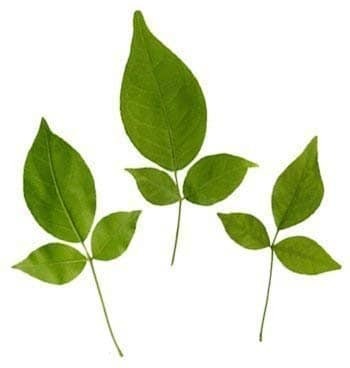 Bilva-Patrais the leaf of one of the sacred trees in the Hindu religion calledBael (बेल). Its holiness is comparable to Tulsi leaves. 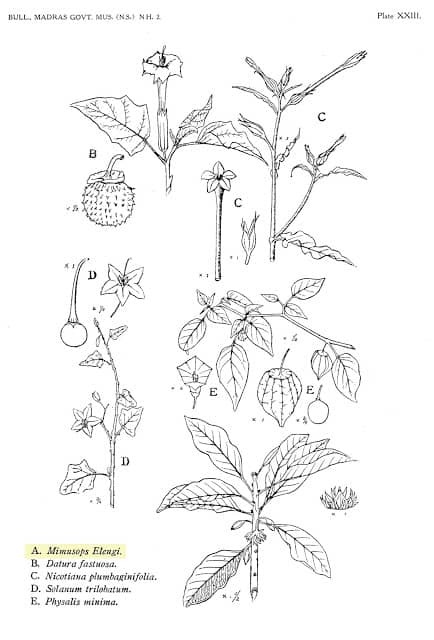 In fact, Bilva-Patra is to Shiva what Tulsi leaves are to Vishnu. Bael is known by Stone apple, Wood apple, Golden Apple or Bengal Quince in English. In Hindi, it is commonly known as Bael or Bel and a leaf of Bel is Bel-Patta. 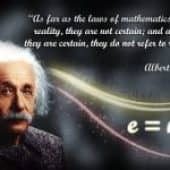 The scientific name is “Aegle Marmelos”. Bilva-Patra is the Sanskrit name. I offer this bael tree which has emerged from the heart of Goddess Lakshmi and liked by Mahadev. So I offer Bilva-Patra to God Shiva. 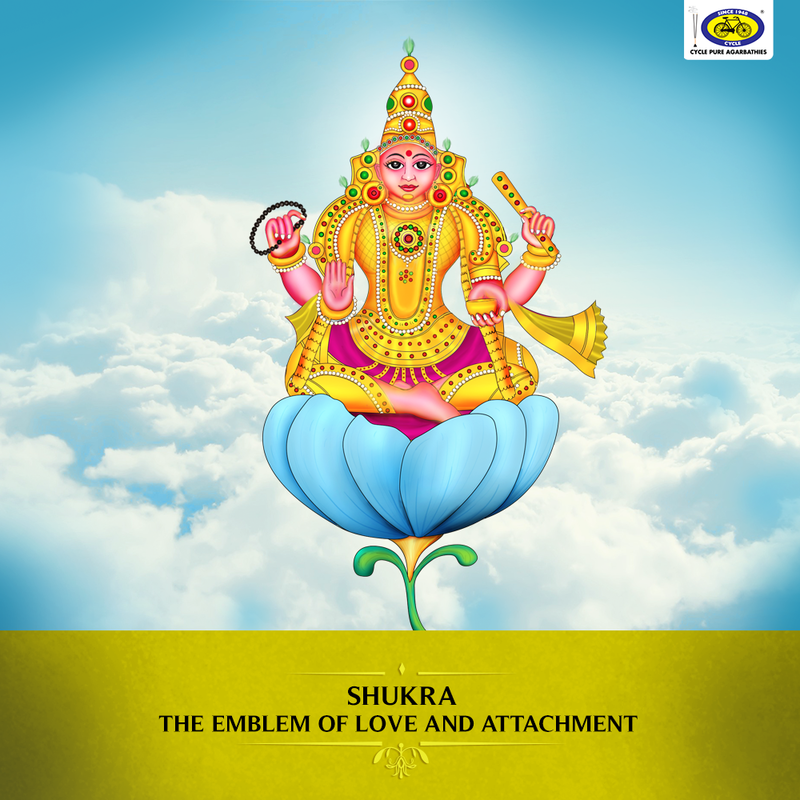 This “Shloka” is also spoken while offering Bilva-Patra to Shiva. In addition to three leaflets, it should be soft, without holes, without spots (दाग) and unbroken. The thicker part of the ‘Belpatta‘ twig (डंठल) which is connected to the tree(called vajra) should be removed. 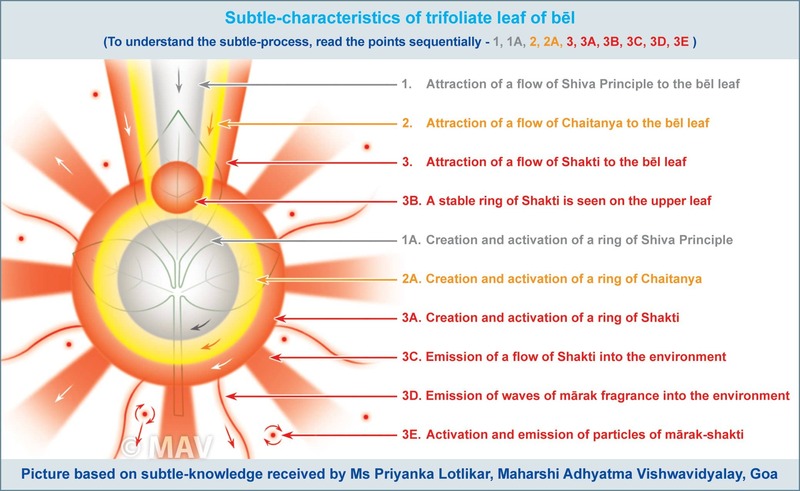 While offering to Shiva or other gods, the ‘Belpatra’ should be put upside down i.e. smooth face touching the ‘Linga’ and tip away from the devotee. 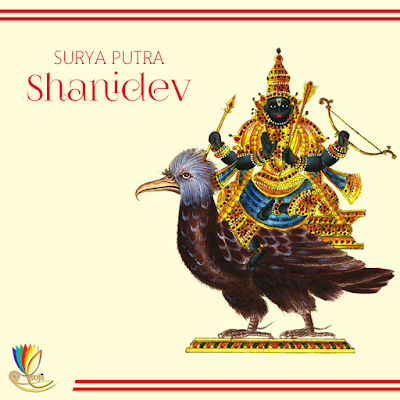 There is an eight “Shloka” “Bilvashtakam” which describes the importance of Bilva-Patra. Before offering the leaves, they are touched or sprinkled with white sandalwood paste (चन्दन). Not only Shiva but all members of Shiva family (शिव परिवार) including Nandi the Guard is offered Bilva-Patra. Ganesh, Gouri (Shakti) and her Avatars like Durga & Kaali and Kartikeya all are offered Bilva-Patra. Since Shiva is like a devotee of Rama, So some people write “राम” with sandalwood paste (चन्दन) or Kunkum (कुंकुम) on the leaflets and offer it to Shiva. Hanuman is an avatar of Shiva and also called ‘Rudra avatar’, so ‘Bilva-Patra’ is also offered to Hanuman. 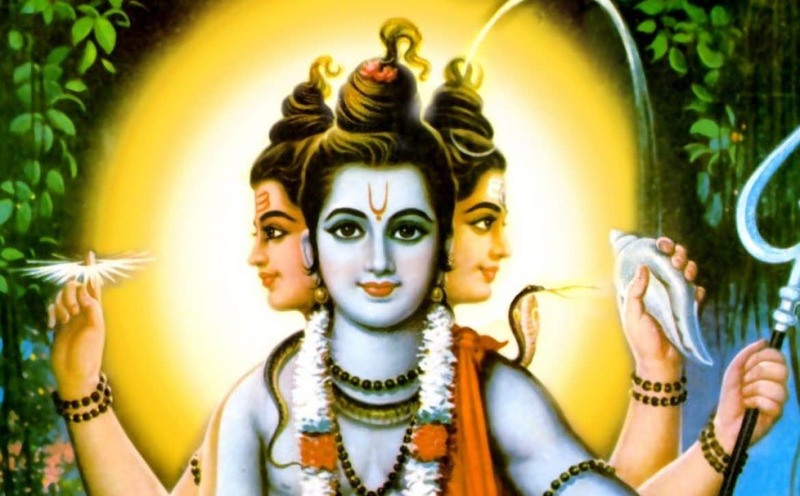 Some devotees think that three leaflets of Bilva-Patra represent three eyes of Shiva:- Two lower leaflets as two normal eyes and one upper leaflet as the third eye on the forehead. 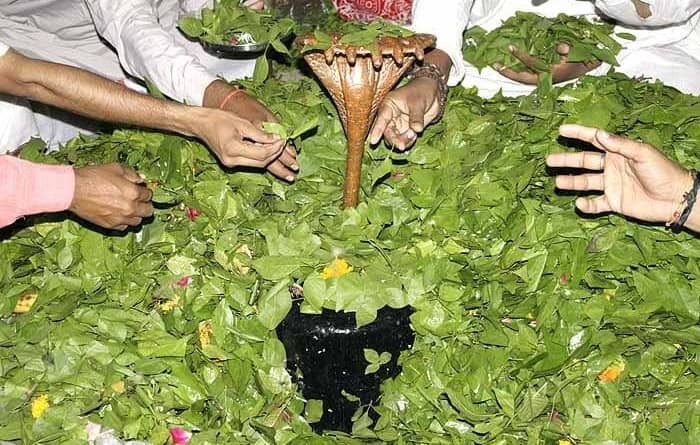 As in any temple in North India, the Pundit gives “Charanamrit” (Holy water with Tulsi leaves) to devotees, similarly, in Bhubaneswar, a Pundit at Shiva temple gives Holy water with a piece of Bilva-Patra. The number of Bilva-Patra offered to Shiva may vary from one to more than lakhs depending upon availability and affordability of the person. I have seen one lakh and twenty-five thousand (सवा लाख) Bilva-Patras being offered to Baba Basukinath by some devotees in the month of “Saavan” and “Aashaadh“. 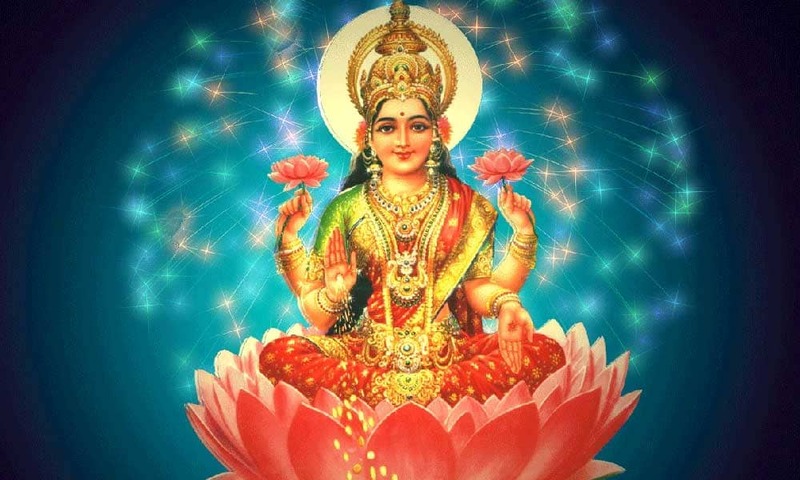 Deepam dev dayanidhe pashupate hritkalpitam grihyataam. 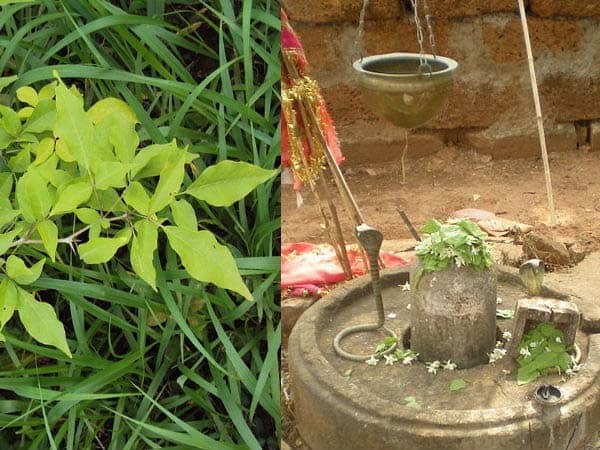 The worship of Shiva-linga under a ‘Bilva-Tree‘ is very fruitful. Watering a ‘Bilva-Tree‘ with simple ‘Jalam’ or ‘Gangajalam‘ gives the ‘Punya‘ of visiting all ‘Tirthas’. Putting the water from near the root of this tree on the forehead destroys all “Papam“. 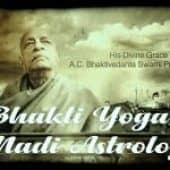 Those who are born in Visakha Nakashtra and Scorpio moon sign or having a birth in Visakha Lagana nakshatras they should either plant Bilwa Patra Tree in their garden and daily give water to this tree or those having health issues related to liver or stomach should take Bilva Juice daily to Nullify the negative impact of Jupiter in their Natal chart. Even meditation under this tree can be blissful too for Visakha nakashtra people. Despite Planting they should Do Rudra abhishek with Bilwa Patra, fruits, Milk and rest of Panch amrits. It can heal the malefic effect of Jupiter with much greater speed if done with proper care and utter devotion. 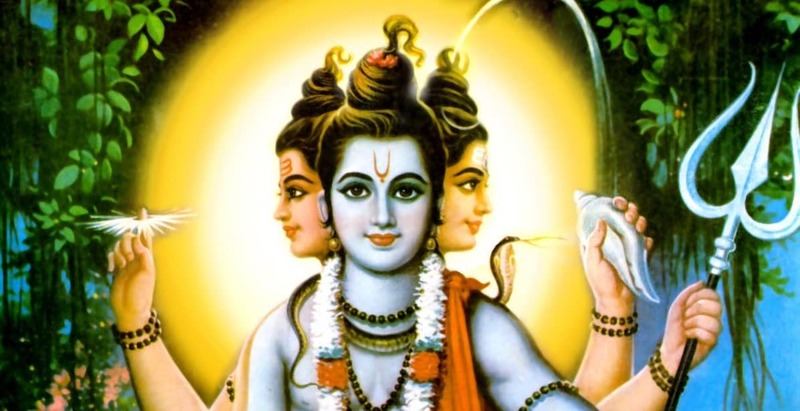 Even those having Jupiter as Bhadhaka planet they should also plant or donate Bilwa planet to someone needy or near Shiva linga in lord shiva temple, that way it can nullify the negative impact of Bhadhaka. If Jupiter is malefic it can lead to trouble of Liver functionalities, Elevation in enzymes, Uncontrolled Sexual appetite, gall bladder issues, Kidney enzymes troubles or sometimes increase in level of infections or Diabetic pattern, Can give increase in Bilirubin- Jaundice, Weakening of body due to extreme heat in the stomach and liver, can leads to gastric troubles or constipation etc too. Reason being according to System of 5 limbs Nakashtras are known and seen for Health Matters of Mind and Body. Any affliction to Native birth nakashtras can lead to disturbed health of Mind and body. 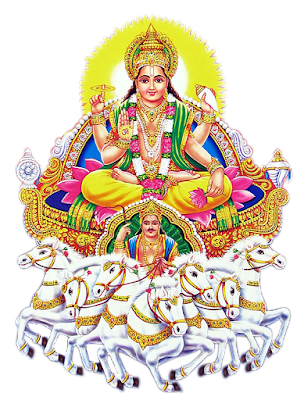 This is the only reason why affliction in Scorpion moon and Visakha Nakashtras lord via nodes are mostly prone to problems of Liver and Genetic organs issues during their Dasha padas. 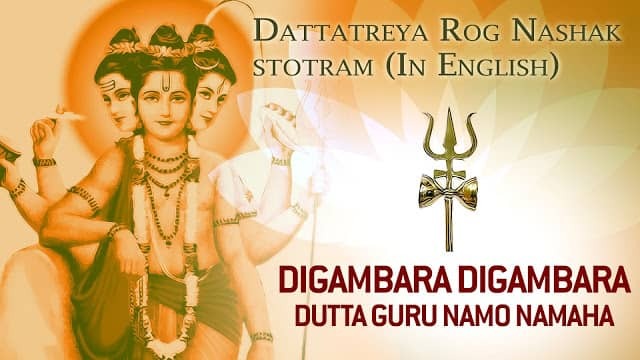 Same way Visakha Nakashtra Diety connected with Indra – the god of transformation, Power and Agni the god of fire, could be another reason why Visakha people are so much extremist in everything in life from sexual appetite to power to hunger. 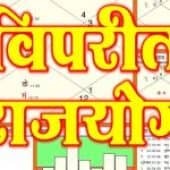 So, Increase in the Level of Tamsik and Rakashas gana in this nakshatra can lead to health trouble due to overindulgence in Sexuality, over hunger, increase in appetite, improper digestion, stomach issues, gas and mostly liver has been found afflicted. 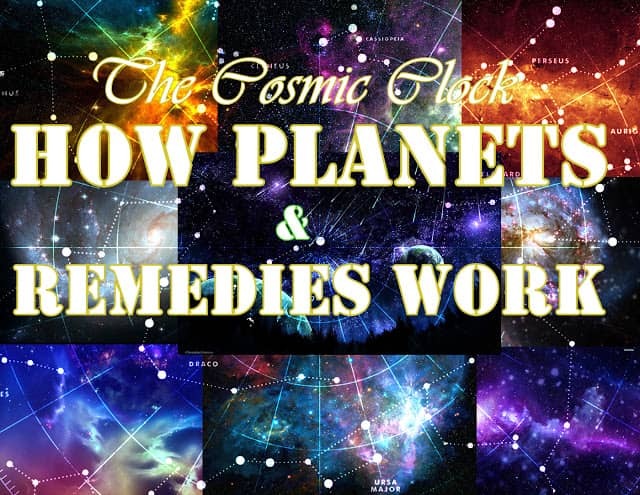 So, best Remedy to cure Viskhna Nakashtra (Scorpion) moon sign is the planting of a bilwa tree and having bilwa fruit daily or worshipping of Lord Shiva with Bilwa Patra and fruit . Bael for Tuberculosis: In Ayurveda, it is used for the treatment of tuberculosis. Bael for Gynecological disorders: The regular consumption of Bael helps to prevent gynecological related issues. 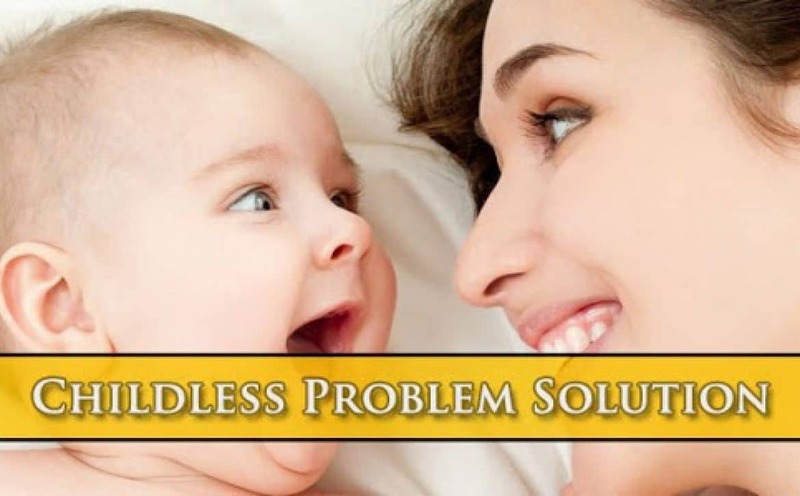 Bael for Urinary diseases: Use of bel leads you to overcome the problems of urinary diseases. 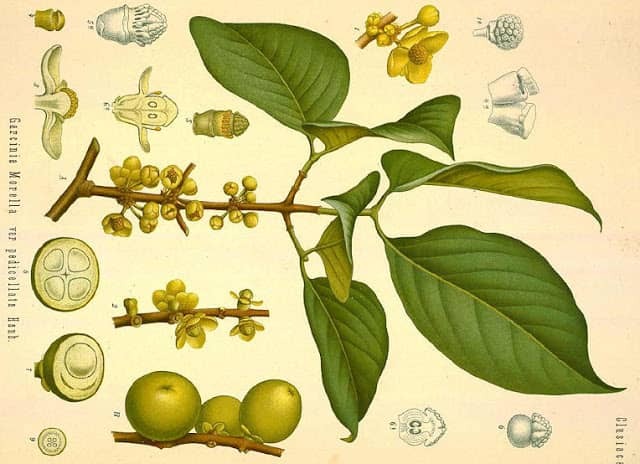 Bael for Diabetes prevention: It has bitter pungent, full of antioxidants and helps to stimulate the pancreas to secrete insulin, which leads to lowering of blood sugar. 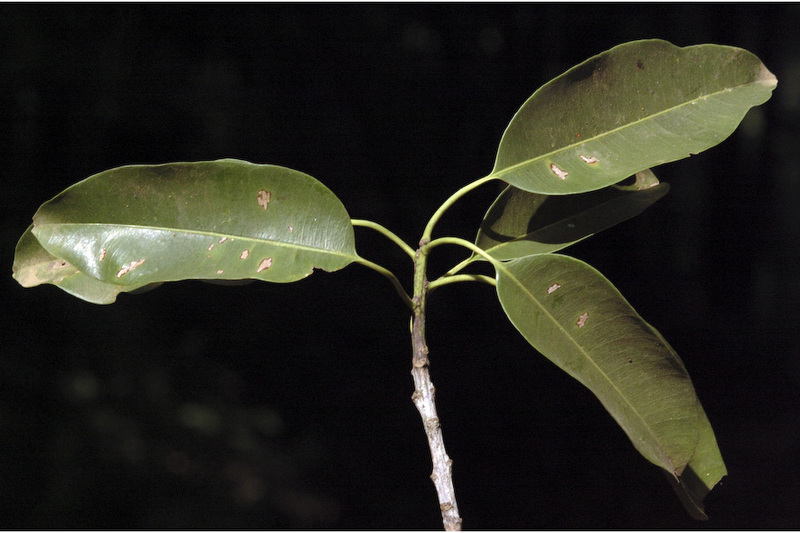 The leaves can be used against diabetes. Bael for Digestive disorders: It supports intestinal biological formulations and protects the digestive system from ulceration, reduces the frequency of Irritable Bowel Syndrome (IBS), intestinal spasm thus beneficial in treating of dirrrhea, dysentery, and other infections of Elementary canal. Bael for Fever prevention: The leaf juice with honey is helpful in prevention of fever. Bael for Epilepsy: Flowers are uses as epilepsy tonic. Bael Nutritional facts: It is rich in alakloids, polysaccharides, antioxidants, beta carotene, vitamin C, Vitamin B, and many other bio-chemical substances. It also contains tannins, calcium, phosphorous, iron, protein and fiber. The 100 gram of Bael contains the following nutrients: Calorific value (137 Kcal), Moisture (61.5g), Protein (1.8g), Fat (.3g), Minerals (1.7g), Fiber (2.9g), Carb (31.8mg), Calcium (85mg), Phosphorous (50mg), Iron (.7mg), Beta carotene (55 UG), Thiamine (.13mg), Niacin (1.1mg), Vitamin C (8 mg), Potassium (600mg) and Copper (.21 mg). Bael for Piles treatment: The extract of unripe bel fruit is helpful in curing of piles and hemorrhoids. 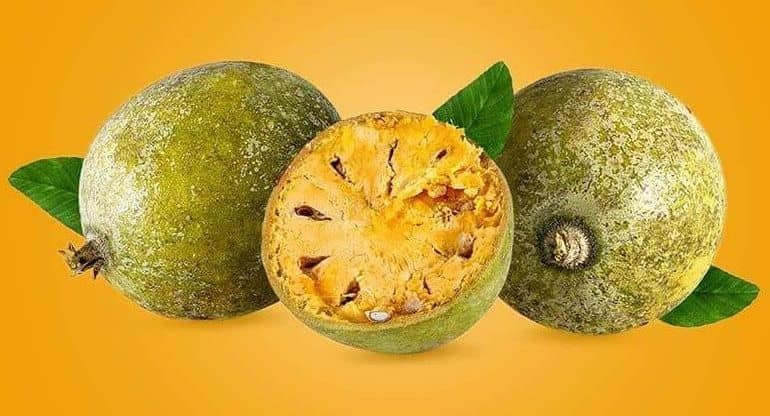 Bael fights ulcer: Due to its soothing effects on the digestive system, it leads to reduce the acidity level in the stomach thus useful in combating ulcers like gastric ulcers, gastrodudenal ulcers, etc. Its juice is used to make drink and squashes, especially in summer season because of its sweet and pleasant nature. Bael tender leaves are used as salads. 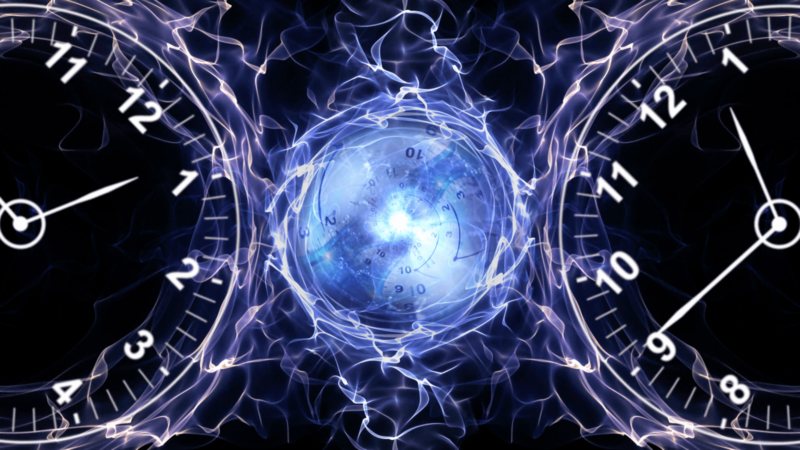 It cleans the atmosphere as it helps to purify the atmosphere by absorbing the harmful gases from the it. It is used to increase appetite. 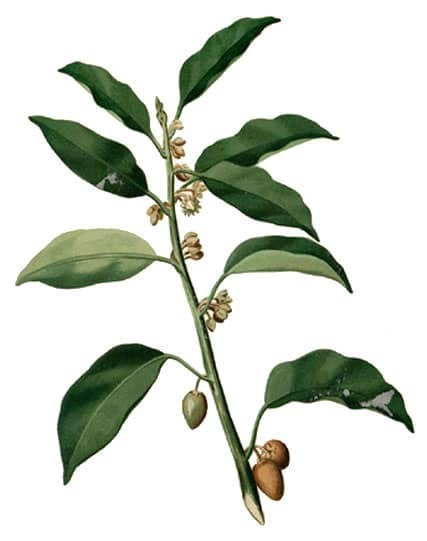 Its extract oil is used to cure respiratory problems. It is used in the preparation of candy, squash, toffee, pulp powder, and other eatable products. Bel is known for its medicinal values because of the presence of many bio-chemical substance such as alkaloids, antioxidants, polysaccharides and essential oils. 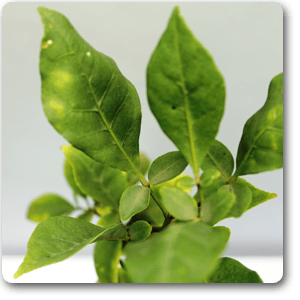 The fleshy inner product of bael is curative, pesticidal, nutritive as well as therapeutic in nature, which is used for the treatment of many diseases and disorders. Wood apple leaves are of therapeutic value and used in lowering of blood cholesterol. It is anti-inflammatory in nature. Its extracts when applied on the exposed area, help to cure inflammation. Bael’s roots are antidiarrhoetic, antidote to snake venom and anti-inflammatory for healing. Bel juice is useful in curing of constipation because of its laxative properties. Bel juice gives great comfort in heartburn, acidity, hyperacidity and indigestion. If you are suffering from intestinal parasites, it is advisable to drink bael juice because of its antidote nature. Aegle marmelos juice is good for heart and brain. Bel juice mixed with Ghee, is beneficial in prevention of heart disease. It is also used as heart tonic. Chewing of raw leaves of Bel help to solve many gastric problems. Bael juice is rich in vitamin C, and good for scurvy treatment. Though Bael is a beneficial Ayurvedic plant, but it has some side effects too. Before eating the fruit, one should take caution in the below given conditions. Abdominal disorders: Excess of bael consumption leads to abdominal disorders. Constipation: If you are taking more quantity of the fruit, it may lead to constipation. Pregnancy: One shouldn’t take Bel during pregnancy. Surgery: It shouldn’t be used in surgery. Diabetes: When taking for lowering of sugar in blood, one should observe sugar level carefully as it may down sugar too low. Hypertension: One should avoid to take this fruit if having high blood pressure. Etymology: Madhugandha (sweet fragrance) and Surabhi (pleasant) are due to its sweet-scented flowers. This is one of Most celebrated sacred tree found in Hindu Scriptures and Puranas and even placed amongst the flowers of the Hindu Paradise.This tree is even mentioned several time in the Ramayana and considered as flowering tree found in the Gandhamadana forest and it is one of common tree found in the Panchavati growing near the lake in full bloom around Pampa Lake. One of an attractive tree adorning the Ashoka Vatika. Many a time it is used for constructing of Bridge and one of main flowering tree blossom in Lord Rama garden. 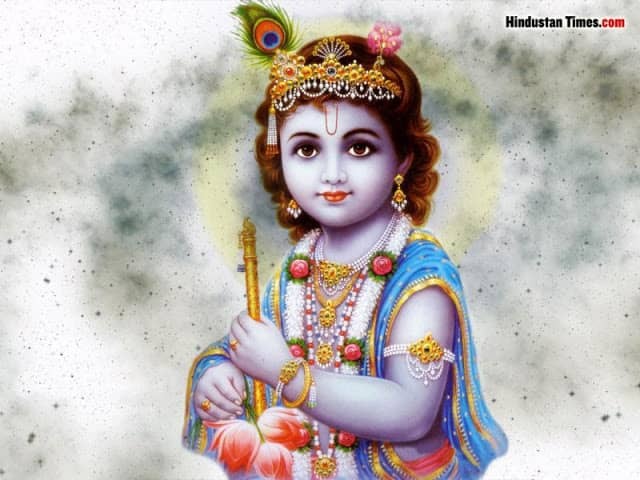 Even Lord Krishna too celebrated this flowering tree by wearing a garland made of Bakula flowers. 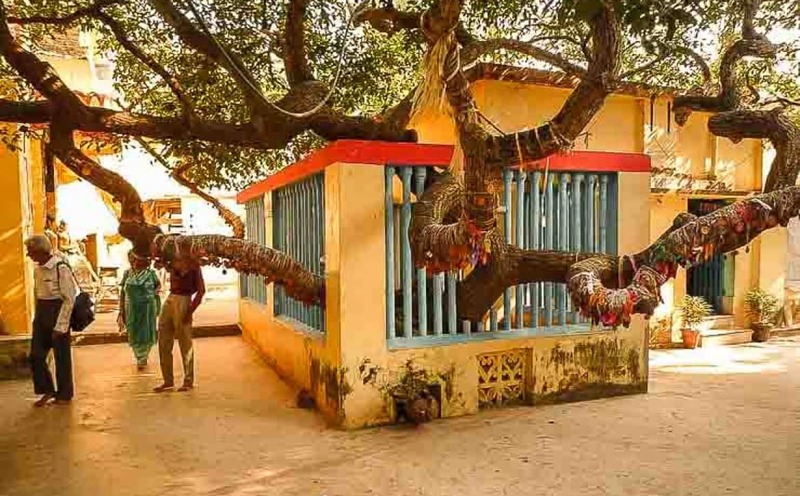 The Bakul tree is mentioned frequently in the Mahabharata – Lord Krishna used to play his flute under a Bakul tree and attract the milkmaids of Vrindavan. The ancient Indian sages regarded these trees as gifts from God. Bakul trees are frequently found growing at temple entrances. The Bakula tree, which is considered male, is planted on the right side of the temple entrance, while the chalta tree (Dillenia indica), which is considered female, is planted on the left side. The dense canopy of the Bakul tree provides a cool shade where devotees can sit, talk, relax and meditate. 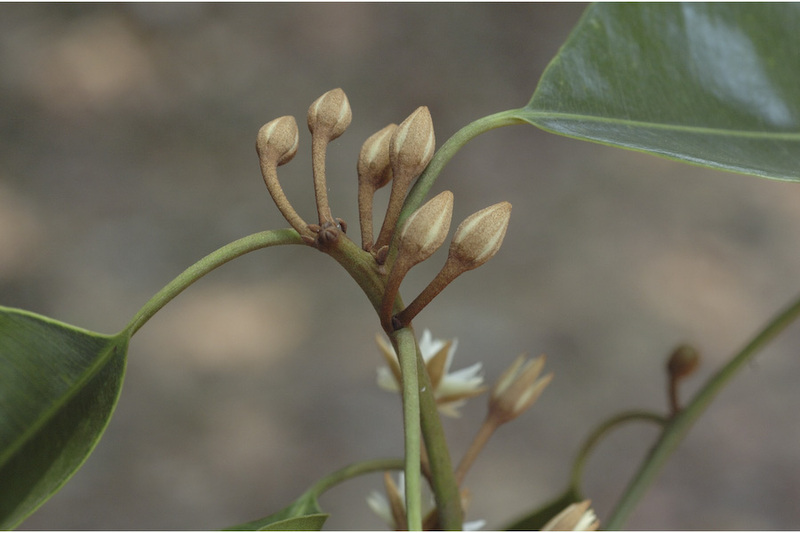 The Bakul flowers are used as offerings to the god. It is one of the 7 Scared trees associated with the Gautam Buddha and also scared to the Jains as it as an Emblem or Naminatha, A Tirthankara, he attained enlightenment under the shade of the Bakula Tree. Bakula flowers are offered to Lord Ganesha during the 21-Pushpa puja. The flowers are considered to be very sacred in Jainism and Buddhism. According to Brihat Samhita, one must plant this sacred tree near houses, Temples and religious places. 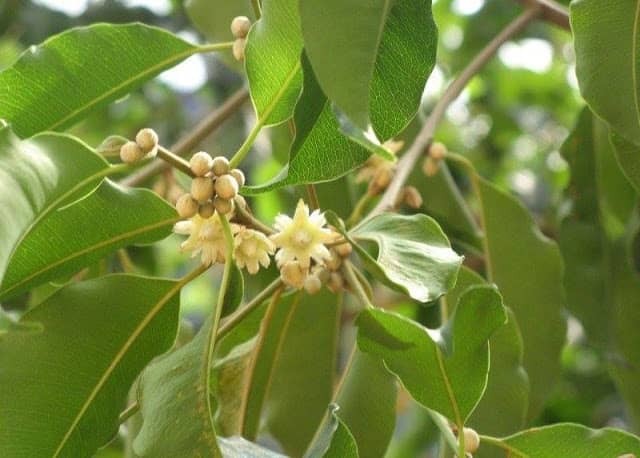 Kalidasa mentioned this tree as a symbol of love and Beauty as the scent of the flowers of the Bakula resembles wines and the fragrance is linked to the breadth of the young women. Even it doesn’t lose its fragrance in the sun too.It is believed that Bakula flowers bloom when a sweet wine is sprinkled from the mouth of a beautiful woman on them. They are the harbinger of ‘Basant’ or spring in India. The blooming phase of the flowers is from May to June. The flowers are small, about 2 cm in diameter. The flower has a crown coming out from the middle. The flowers would fall by morning, however, the fragrance remains as-it-is. 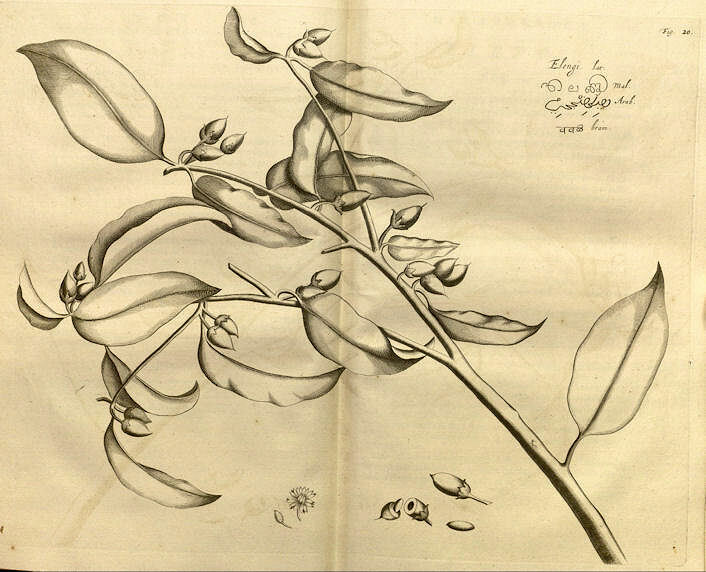 The Bakula Pushpa plant has lots to offer and is also called Indian Medlar or Bulletwood tree when it comes to therapeutic benefits. However, Indians aren’t stranger to their beneficial properties for hair care and skin care. Known as Bakula to us, back home, this tree finds mention in the ancient scriptures of Ayurveda as well as in Kalidas’ Megduta. Natives those are born in Anuradha Nakashtra in moon sign of Scorpio or in Anuradha Ascendant and those having Saturn as Bhadhaka graha or for Capricorn Lagana Where this Nakashtra also falls in Bhadhaka Sign too, should Plant this tree in their surroundings or near houses and they should donate this tree either in any temple or any religious place for curing para-Psychological diseases or troubled by this nakshatra. Even those are born in Anuradha Nakashtra, they should meditate under this tree daily to cure of Negative impact of this Nakashtra in their Mental and physical health. 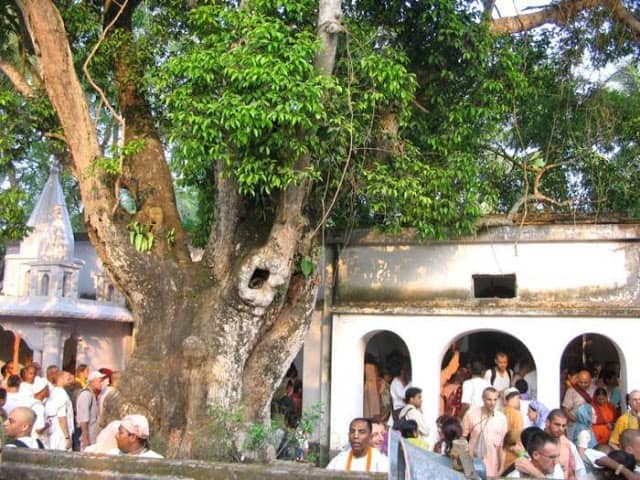 Siddha Bakula tree is a certain tree in Puri in the state of Orissa, India. Under this tree Haridas Thakur, the famous Indian saint sat and chanted the holy names 20 hours daily. Bakul tree belongs to the mimosa family of trees. 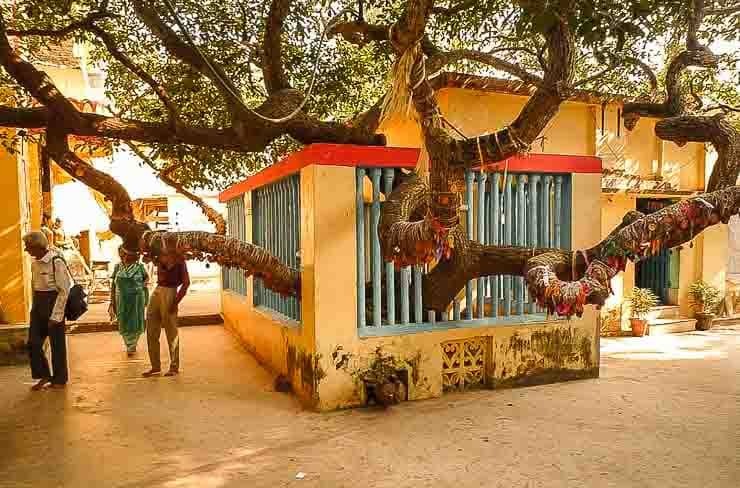 The original tree which dates 500 years ago can still be found at this place today and is revered by pilgrims and tourists who visit Puri. Siddha Bakula is located near Gambhira Temple on Bali Sahi road. Siddha Bakula is the bhajana kutir of Haridasa Thakur, the place where he chanted 3,00,000 names of Krishna daily. There is a small temple featuring a murthi of namacarya Srila Haridas Thakura in a sitting pose chanting japa. The site has extraordinary bakula tree winding and climbing around the courtyard. Tree looks like it exploded or it appears like petrified wood; completely dead. Yet it is wonderfully flourishing with lush green leaves and fragrant flowers. In another temple altar is Sadbhuja Gauranga (six-armed Gauranga) in the middle and Sri Nityananda Prabhu and Advaita Acarya. 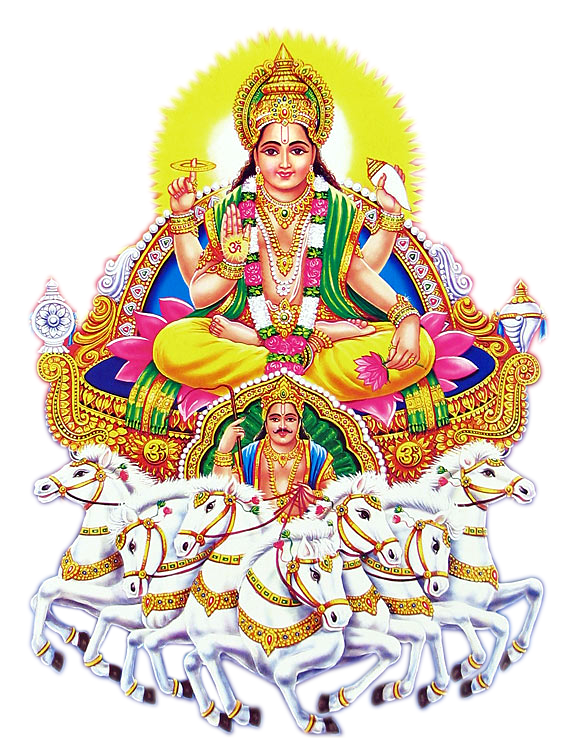 There is also a Deity of Lord Narasimhadeva. Bakula Bakula Amavasya ( Associated with the Amavasya) Bakula flowers are offered to the manes, seeking Their blessings. 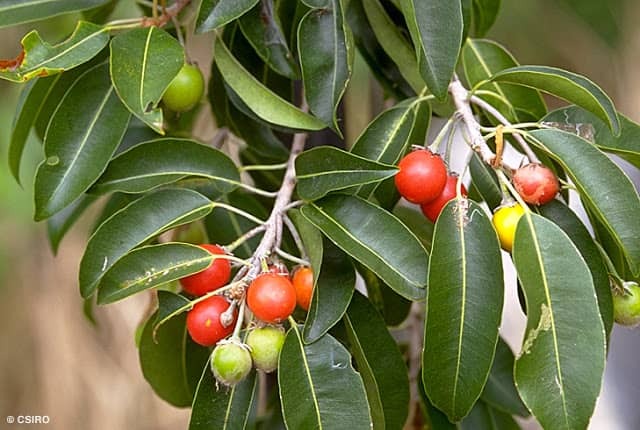 Bakula is a lovely green small tree of the Indian subcontinent. 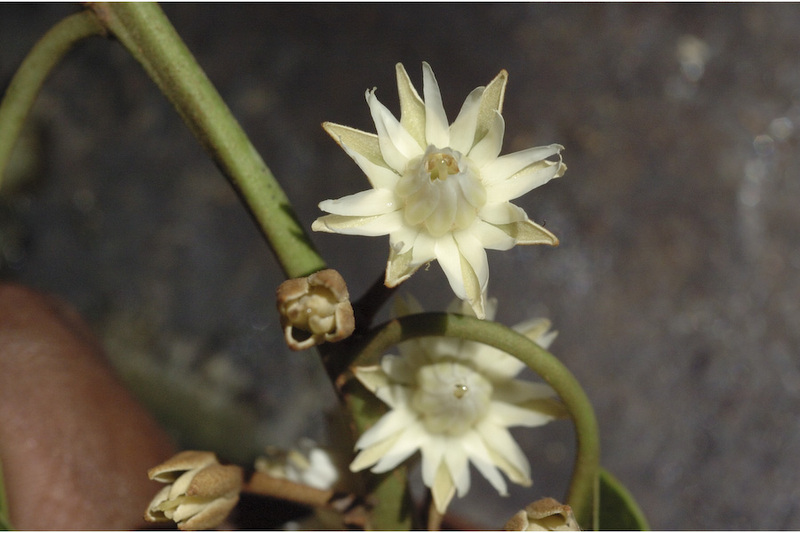 With its small shiny, thick, narrow, pointed leaves, straight trunk and spreading branches, it is a prized ornamental specimen because it provides a dense shade and during the months from March to July fills the night air with the delicious heady aroma of its tiny cream coloured flowers. 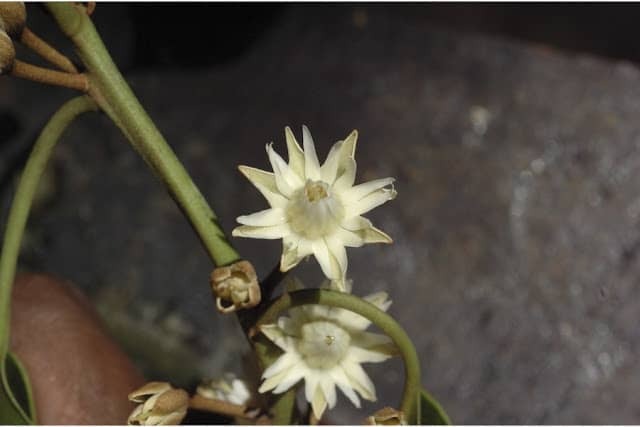 Flowers are small, star-shaped, yellowish white in colour, with a crown rising from the centre. 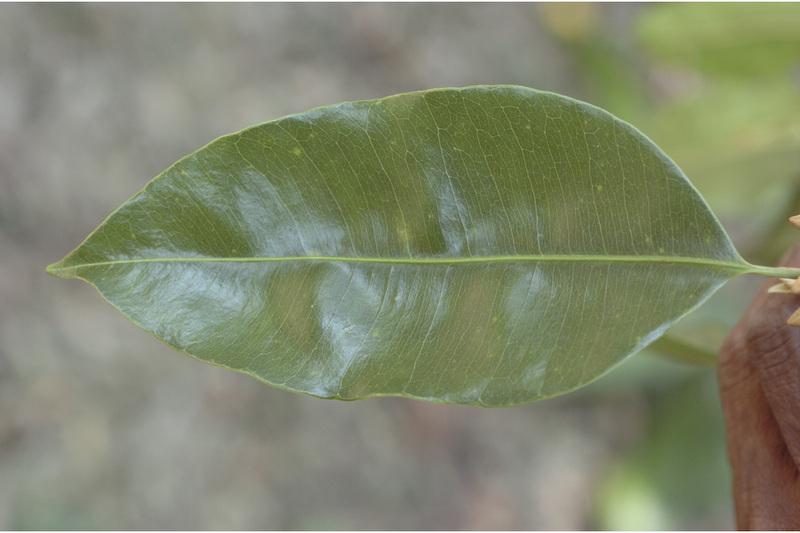 Oval leaves, wavy at the margin, about 5-16 cm and 3-7 cm wide. In the morning the fragrant flowers which so graciously scented their surroundings with their deep, rich, fragrance during the evening hours, fall to the ground. People love to collect them as they retain their odour for many days after they fall. They are offered in temples and shrines throughout the country. For Curing Such problems Spiritually native of Anuradha Nakashtra should do worshipping of Lord Krishna and Shiva with this Flowers daily and should do Meditation under this tree to get rid of sins and diseases after worshipping Lord Arunachaleshwara (Lord Shiva) in Annamalaiyar Temple, a Hindu temple dedicated to the deity Shiva, located at the base of Annamalai hills in the town of Thiruvannamalai in Tamil Nadu, India. As this tree is very much scared to Lord Shiva, as one of the names of Lord Shiva is too Bakula. Even it is said that women circumambulate the scared tree and tie a cradle to it they will be blessed with a male child. This nakshatra is associated with the Anuradha nakshatra and 2nd pada of Ashwini. 1. 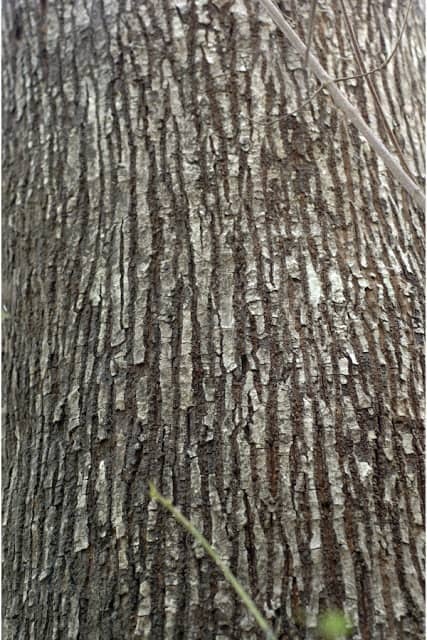 The bark is used as a tonic to reduce fever. 2. Leaves are mostly used as an antidote for snake-bite. 3. The pulp of the fruit is used in curing chronic dysentery. 4. Dried flowers powder is used as a brain tonic. 5. Seeds of the tree are an agent for purging the bowels. 6. 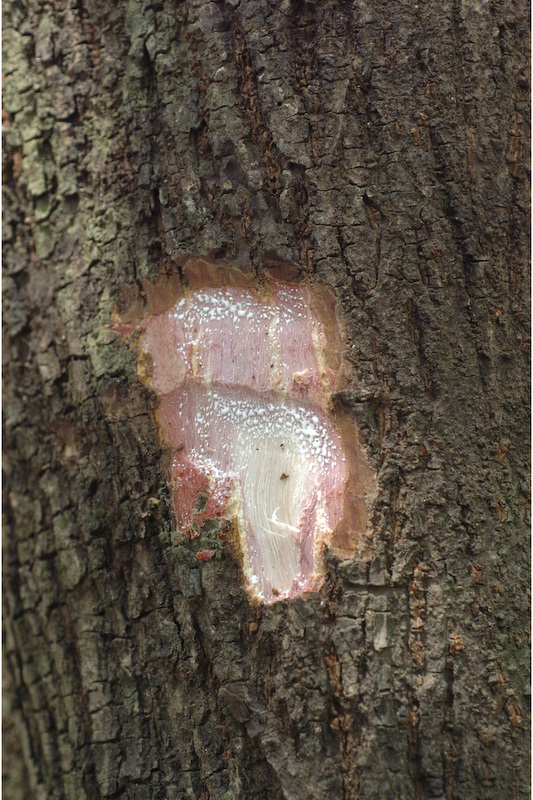 Powdered bark is used for curing Tingling sensation of teeth by Massaging it in gums. 7. The decoction of the bark is used for mouthwash Toothache, Tooth Decay, Gum Bleeding, Bad breath, Pyorrhea, Inflammation in the mouth. 8. Bark powder can be used in Toothache. 9. Tender twigs are used for Teeth cleaning and strengthening gums. 10.Unripe fruits are used as masticatory for tightening Loose teeth.11.Fruit pulp is used for Improving fertility in women.12. Ripe fruit can be used promoting delivery. 13. Leaf juice if taken twice daily with honey can help weak Eyesight. 14. Fruit pulp can be used for Chronic diarrhoea. 15. The dried flower powder is used for headache.